Ten-year-old Hannah Hewett, who hails from Tahlequah, is a national championship sprinter. Photo by Brandon Scott. Hannah Hewett describes herself as “a bit of a diva,” but perhaps she has a reason: She is an award-winning athlete at the age of 10. 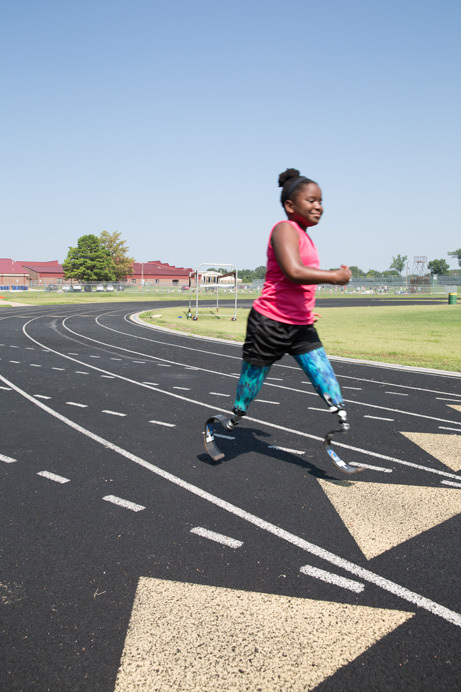 Born with bilateral tibial hemimelia, meaning she was born without the tibia bones between her knees and ankles, Hewett has been a double above-the-knee amputee since she was nine months old. It may explain her competitive spirit. “I have probably always been competitive because I have always had to fight to keep up with everybody else,” Hewett says. In addition to being born without tibias, Hewett’s arms are fused at the elbow, which limits movement in her fingers. She has had three hand surgeries, and her family is looking into reconstructive surgery for her elbows. Hewett has many other talents and skills beyond track. She’s also good at limbo and playing hide-and-seek. She also loves to swim and play basketball and soccer. Her father, John Hewett, was recently diagnosed with Parkinson’s disease. “Hannah has been an inspiration to him in overcoming his challenges,” says Kim Hewett.